Today at 14:30 (CET) we expect the release of two economic indicators: Core retail sales, CRS in Canada and the preliminary Q3 GDP in the US. CRS is released monthly by Statistics Canada and shows a relative change in the total value of sales at the retail level, excluding automobiles, which account for 20% of the total volume. CRS is a monthly measurement of all goods sold by retailers, based on the sampling of different types of retail stores. The index defines long-term trends in consumer activity. The quarterly US GDP is also of interest primarily for long-term investors. Let us remind you that GDP expresses the cost of manufactured goods and services and adjusted for inflation. The GDP indicator shows the change in values of the previous quarter (%).In our opinion, the greatest volatility is expected today from the US currency relative to other liquid instruments. 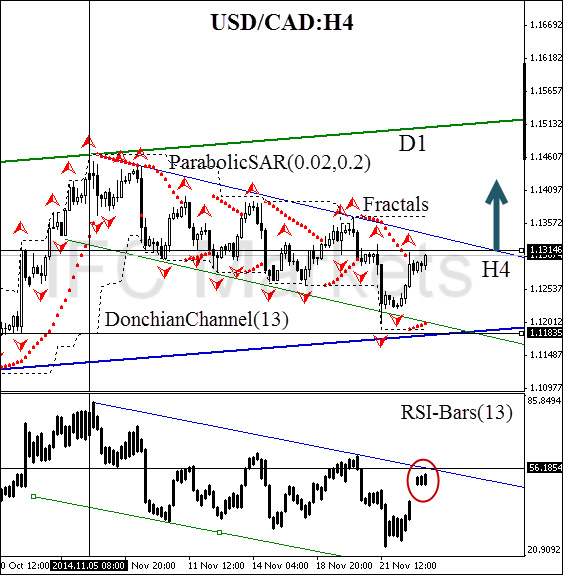 Here we consider the USD/CAD currency pair on the H4 chart. The price is preparing to move in the direction of the green zone, as evidenced by the Parabolic reversal. The fractal support level at 1.11835 is crossing the daily bearish trend line, which makes this mark suitable for reliable risk mitigation of a long position. A pending buy order can be placed above 1.13146, which is also confirmed by Parabolic historical values and the fractal. Conservative traders are recommended to look for the RSI-Bars resistance level breakout at 56.1854%. This signal must confirm the opening of a pending order.